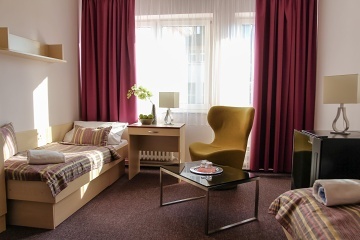 The school hotel Junior provides accommodation in the centre of the Poděbrady spa town. 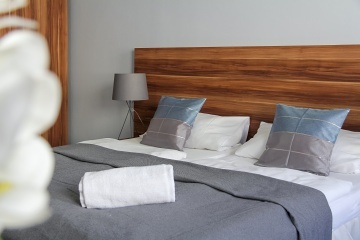 There are single, double and three-bedded rooms all en suite, with TV, minibar and phone. The capacity is 36 rooms, i.e. 103 beds. As the part of the spa stays meals and accommodation are provided. We accept payment in cash (only Czech crowns, not foreign currency) or by credit card. Travel agencies and groups over 15 pax are provided 10% discount from the listed prices when paying by one bill and staying for at least two nights. The handicapped (members of the Physically Handicapped Union) are provided 15 % for groups over 20 persons and stays over 5 days (full boarding is a must). Prices are listed without breakfast and spa fee which is 15 CZK/person/night. Children under 2 year old stay free. The school hotel is a non-smoking facility. Confirmed reservation may be cancelled 30 days prior to the arrival date without any cancellation fee.